One of the well-known techniques of Smash Bros, "edge-hogging," will be revamped for Super Smash Bros Wii U, as a recently released screenshot and comment from Masahiro Sakurai shows. There are many changes being made to attack and defense options for grabbing ledges. 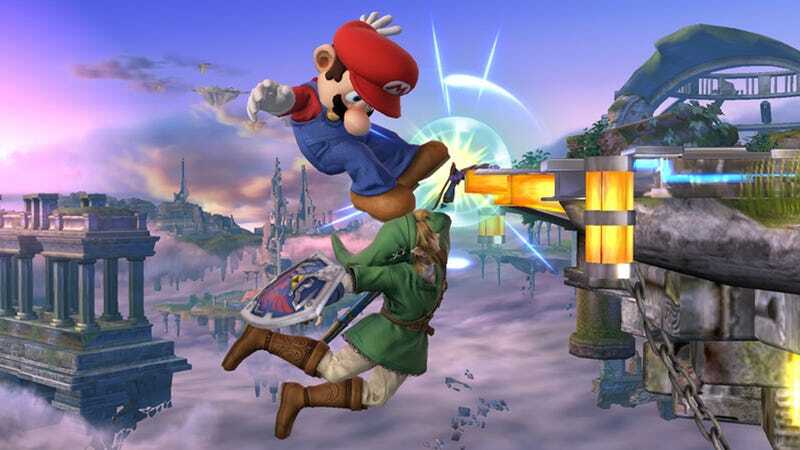 In this picture, Link is actually trumping Mario's grab. -Air time and accumulated damage will determine your period of invincibility while hanging on an edge. -Grab controls will no longer be affected by whether you have above or below 100% damage. So all those who considered edge-hogging a cheap tactic can cool off, because it will probably be a lot harder to pull it off in the new game.